Hexagonie provides an innovative way to teach French to Primary School pupils. Part 1 is aimed at pupils in Years 3 and 4 (or older pupils just starting to learn French) . 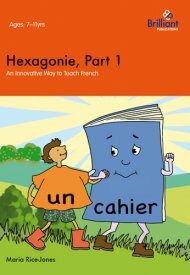 "C'est" and "ce n'est pas"
Hexagonie - Part 1 has been developed for use with children at primary school who are beginners to the French language. It is best suited to years 3 & 4 (age 7+) or older beginners. Full teaching notes are provided and this is a suitable resource for either specialist or non-specialist teachers.